Today, BroadbandTV (BBTV), the fastest growing Multi-Platform Network (MPN) in the world*, unveils that it is the largest MPN globally. 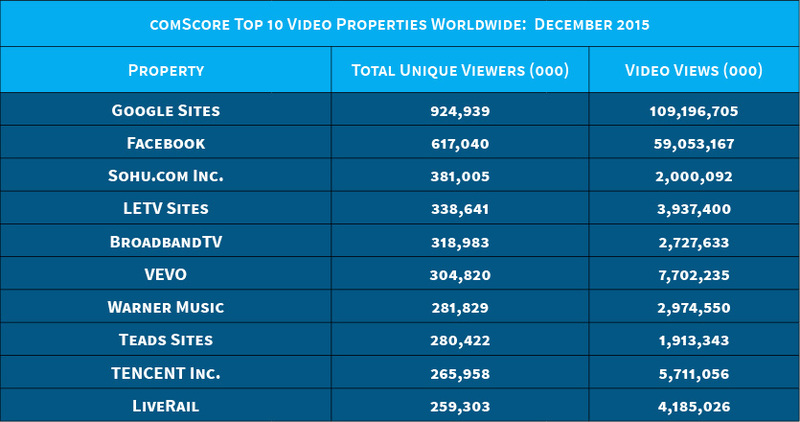 According to comScore’s December 2015 worldwide desktop video report**, BroadbandTV achieves nearly 319 million worldwide unique viewers, 30% more than Maker Studios, a growth of 152% year over year, making it the fastest growing MPN player in the industry*. BBTV attributes this consistent network growth to a number of drivers, including: its strong media brands in high growth content verticals, existing network of creators experiencing organic growth and new partners joining its network, strategic partnerships, and the efficiencies gained by its internal and external technology solutions. The report also shows 2.7 billion total worldwide desktop video views in its network, 14% (13.69%) more than the nearest competitor, and its total watchtime is also the greatest in the market by 14% (14.06%). BBTV now leads the MPN market in unique views, total impressions, and total minutes watched. According to Google Analytics, BBTV now totals 14 billion monthly impressions as of January 2016, for both mobile and desktop. In addition to leading the MPN market, BroadbandTV has one of the largest overall video audiences worldwide, following only Google, Facebook, Sohu, and LETV. BroadbandTV’s total reach of 14 billion monthly impressions is more than 2.5 times greater than Maker Studios’ at the time of its acquisition by Disney. In 2015, BBTV experienced 219% year over year growth, for both desktop and mobile based on Google Analytics. BBTV’s content creators span a number of key media brands including: TGN, the most engaged gaming network on YouTube; Opposition, the largest hip-hop music video network; number one Electronic Dance Music (EDM) video network, WIMSIC; leading kids and family network, HooplaKidz; and Outspeak, a strategic partnership with The Huffington Post. Most recently, BBTV announced a strategic alliance with BMG to create Windfall, a venture that provides an end-to-end offering for music artists across all platforms.